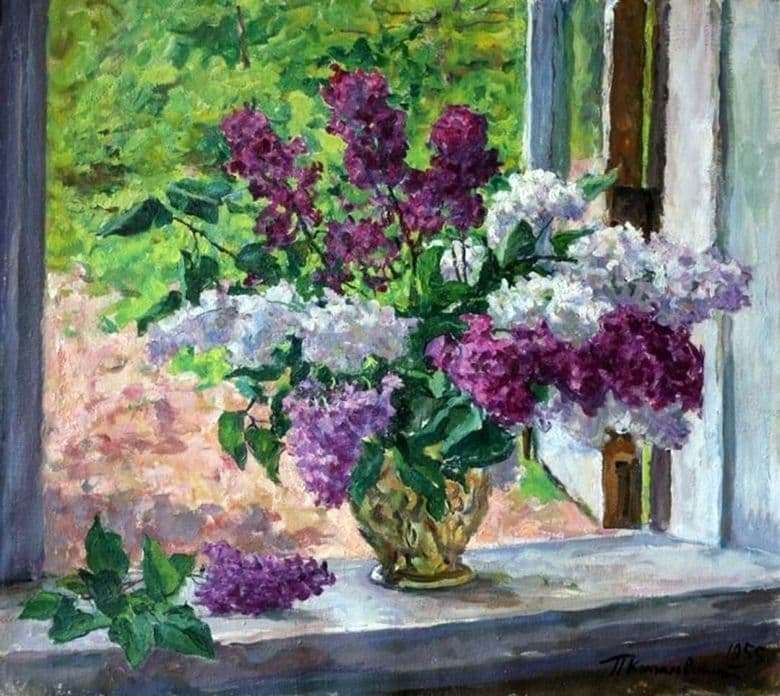 The image of Konchalovsky of lilac passes through the thread through all of his work, still lifes with these colors have become the hallmark of his painting, the painter himself is often called the lilac singer. On the canvases of different years he depicted bunches of various shades, never repeated in the variety of bouquets, various vases and baskets, locations – on the floor, on the window sill, in the garden. But always this magnificent flower is full of vitality and is able to cheer up the audience with its beauty and grace. On a canvas in a natural edging of the window, as in a frame, against the background of luxurious garden greenery stands a glass vase with a beautiful composition of flowers. One lilac brush with emerald foliage rests side by side on the windowsill, resembling the author’s painting in the corner of the picture. The bouquet gives the impression of life, flowering and joy. Shades of inflorescences are selected with an exquisite taste characteristic of the artist. These are snow-white with bluish tint, purple, pinkish and violet large stars of terry lilac. The composition itself is as if composed by a skilled florist. The sun brightly illuminates the sandy path in the garden, painting it in a pink-beige color, which the painter expressed with sweeping strokes, as well as the green foliage of the garden. In contrast, the lilac flowers themselves were written out carefully, even five-petal flowers are visible. This technique – a broad brushstroke of the background and a scrupulous image of each flower – is peculiar to all the “lilac” still lifes. The bouquet is carefully hidden from the scorching rays in the shade of the window. The still-life, in addition to external beauty, includes a rather capacious meaning, conveying to the audience the transience of a beautiful moment: fresh lilacs, torn literally just now, begin to bloom buds, and after a while they should wither and fall off. The master managed to express admiration for nature, admiration for it, the spring triumph of awakening under the action of the sun and the warmth of nature. The bouquet draws attention with its simplicity and emotional wealth.